Fiiinnnnaaallllyyy I have developed lovely vanilla coconut flour chocolate chip cookies, and they’re amazing. At only 2 g net carbs per cookie, it’s a no brainer when it comes to coffee and cookie time. Read below why I don’t use sugar free chocolate. Scroll below for the NEW quick cooking video to show you just how easy these cookies are. Everyone loves a chocolate chip cookie but the regular ones are so high in sugar, flour, gluten and questionable fats, we have learned to give them wide berth and avoid them completely. And for those of you who have a nut allergy, trying to find a coconut flour chocolate chip cookies recipe that actually works, can be difficult. If you haven’t baked with coconut flour yet, always try using recipes that have been developed using coconut flour already. It can be a tricky little sucker to work with and it behaves completely different to wheat flour and almond flour. Coconut flour requires much more moisture and generally a lot more eggs. But in a cookie, it is perfect. Read this article where I compare coconut flour vs almond flour. And if you want to see my back catalogue of coconut flour recipes, click here. All the recipes are either made with coconut flour, or I have written conversions to swap almond for coconut flour. The trick I use every time I bake with coconut flour, is to flavour the recipe heavily to overpower any subtle coconut taste some people find. For a savoury recipe, I would add extra herbs, spices and cheese, for a sweet recipe I would add extra vanilla and sweetener for example. I use cacao nibs in my coconut flour chocolate chip cookies because they don’t melt when baking AND I cannot find a sugar free chocolate that doesn’t have bad sweeteners in them. Remember to avoid maltitol. Many nutritional panels don’t add it to the carbohydrate count, but it does raise blood sugars. Regular chocolate chip cookies are incredibly sweet. Remember to adjust the sweetener in all my recipes (very important in this case) to YOUR taste. We are all on different paths to our sugar free journey, so one person may require double of half the sweetener stated. Add a small amount each time, because you cant take it out and don’t want an over sweetened recipe. If you are using stevia, too much will turn the recipe bitter – and no one wants a failed cookie. 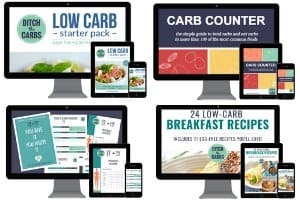 Each time you make low carb recipes, you will probably require less and less as time goes on. When I make these, my kids always prefer them warm out the oven OR once they have sat on the kitchen bench covered in a tea towel for a day. I think the cookies absorb some moisture from the air and it affects the texture. Either way, they love them. 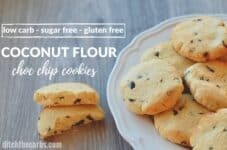 Quick and easy low-carb coconut flour chocolate chip cookies are perfect to enjoy with a cup of coffee, or pop one in your children's school lunch box. Cream the softened butter and sweetener together until light, pale and fluffy. Add all the other ingredients and mix well until combined and the mixture begins to thicken. Squeeze a small handful into a ball, then press into a cookie shape with your fingers. 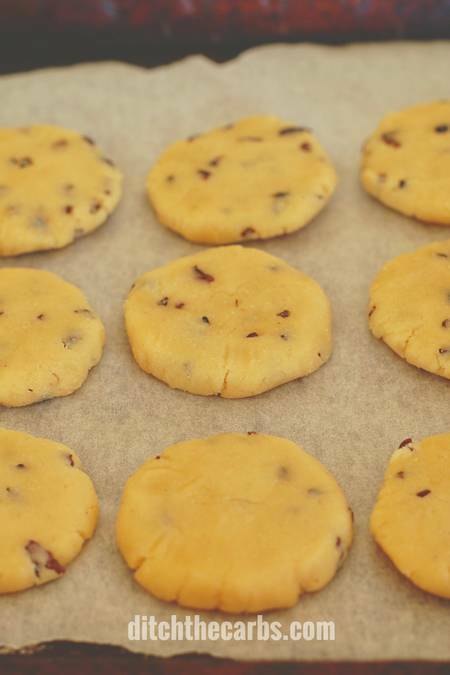 Place the coconut flour chocolate chip cookies on a lined baking tray and bake at 180C/350F for 10-15 minutes, or until golden brown on the edges. Allow to cool for a while, then remove and place on a baking rack to cool down completely. These cookies are even nicer the next day. Just started low carb eating. I used coconut palm sugar as the sweetener. Love these cookies! They are soft and cake-like but definitely satisfy my sweet tooth! I have used puréed avocado and omitted the butter in chocolate chip cookie recipes, then I have used date paste to substitute for the sugar (a little goes a long way since dates are very sweet). My family has a long history of diabetes and heart disease so cutting carbs where we can is something we try to do. I have been looking for a good substitute for the flour, will coconut flour bake well with puréed avocado and date paste? I’m afraid I can’t offer advice on these substitutions as that makes another recipe entirely from what I developed here. Dates are very high in sugar and will raise blood sugars accordingly. I wonder if you might consider using a sugar substitute? This is what I use. Sorry, I couldn’t have given you a straight answer in this instance. Thank you for this recipe. I recently received a medical which needs me to totally swap my ways of eating, which has resulted in me following a low carb way of life. I definitely have been missing the comforts of sweets, but now, with so many great products readily available (I was surprised to find coconut flour at just the regular grocery store – because it definitely doesn’t have frilly items). These were so simple to whip up and I LOVE that they are cakey. I used some sugar free chocolate chips bc that’s what I had on hand and it worked. Love love love. Thank you again! Thank you. I love the simplicity. Mine don’t have a cookie texture, more sponge/ Madeleine-like but delicious. I substitute half the vanilla with almond extract and don’t bother with cacao nibs – I like them plain and simple! New to low carb cooking…so forgive me if I’m missing something..but on my coconut flour pack says 16g carb per 100g. This makes 9 cookies so around 2g carb per cookie rather than 5? Is that right? I use stevia/erythritol too and as this doesn’t cause a glucose spike I don’t count it in…..? It will vary depending on your brand of flour. 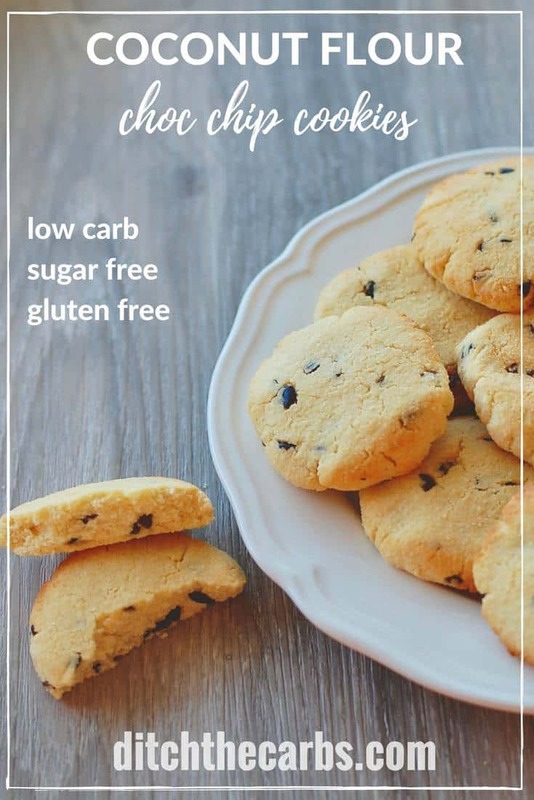 The brand I use – for 2/3 cup coconut flour its 16 net carbs, and I turned this recipe into 16 cookies, so effectively making them 1 gram of net carbs per cookie. Hello there! These cookies are great! I have made them twice! I tried scrolling through the comments, but I couldn’t find any answers. Has anyone tried freezing the dough? I’m curious if the cookies still turn out. Great recipe! I found Lily’s sugar free chocolate chips, sweetened with stevia, at our local publix store. I was so excited to try and make this tomorrow and then I realised that I only have about 80g of butter left in the fridge. Can I substitute the rest with coconut oil instead? Is it possible to freeze the recipe? I say freeze the dough in small balls, to bake another time. Hi- new to low carb and trying get to know what has and doesn’t have carbs . Could you please explain where the carbs come from in this recipe- which I’m trying Over the weekend . Many thanks for your recipes. The carbs are mainly from the coconut flour and cacao nibs. Begin by tracking what you eat and look at nutrition labels. That is the best way to learn where carbs are in food. And it helps you know what to avoid, and what to enjoy. I just made these and they look beautiful but came out very bitter. Any idea what would make them have a yucky aftertaste? I followed the recipe to a T, except I added real chocolate chips. It sounds like either you used too much stevia(if that was your sweetener of choice), or accidentally added too much baking powder. They are the only possible bitter ingredients in this recipe. Hi, I just made these and they are amazing. I added some cocoa powder for a more chocolate cookie. I did find them a touch dry, do you think this is because I’d the cocoa powder? Yes by adding cocoa powder, you are adding more dry ingredients. You could whisk an egg in a cup and add half – that might help with the moisture. I am just guessing this as it will be a whole new recipe entirely but that is where I would start. Yum. Alternatively you could add some extra butter but the cookies have a risk of not holding together well. Just made these cookies, my recipe made 16 using a cookie scoop, laying waxed paper over the tops and flattening them with a flat bottomed glass. Worked great. I also used Lily’s stevia sweetened chocolate chips. And also made a drizzle using powdered unsweetened cacao, thinning with water, and a pinch or two of erythritol to sweeten a tad. This little drizzle gave the cookies a little oomph, as they were a bit light and bland looking. For a maiden voyage on this, they turned out well. Also baked them on parchment paper. These were easy to put together, and I’ll probably make them again since i mostly make that 3 ingredient peanut butter cookie, and a change is nice once in a while. Thank you for the recipe. YUMMMMMM. For a maiden voyage 😉 I think you have created a winner cookie! I want totry your recipe but I don’t have cacao nibs. Is it ok to use chocolate chips? Sure but it won’t be sugar free. Alternatively you can chop up 90% chocolate. That is ah-mazing! Whipped these up today as fiancé and I are ditching the carbs before our Halloween wedding. They’re surprisingly yummy. Ate them about an hour out of the oven. Looking forward to how they are tomorrow. It’s my first time baking with coconut flour and I’m now tempted to try the mini cheese loaves. Have only just discovered your website but can see it becoming my go to over the next few months! Man, you have lucky co-workers that you are baking for them. Just made them and absolutely love them! Made it with a coconut oil and a bit of almond butter instead of regular butter and with caramel stevia instead of vanilla. If I wouldn’t distract myself, the whole batch would’ve been gone already! Also, it is so quick and easy to make! I’m on a candida diet and am having a hard time finding snacks but I’ll definitely bake a batch of this weekly to keep me going! 10/10 – the best low carb cookies yet. Totally amazing recipe. Followed the recipe exactly and they were perfect. Kids loved them too. YAAAAAAAAAY – I love these cookies too. Simple ingredients and are perfect for lunch boxes. Last week I ran out of cacao nibs so used finely chopped 90%. Yum. Sorry not in this recipe. You may wish to read this article where I explain the differences between all the low carb flours. Coconut flour and almond flour work in completely different ways, so are not interchangeable. Made these with coconut extract instead of vanilla. I used erythitol. I followed recipe and used a cookie scoop and was able to make 18 cookies. They tasted satisfactory, not too sweet, but sweet enough. Would be good with a cup of coffee or tea. I used Divine Organic raw cacao nibs (found these at HomeGoods). I can’t even we the ear recipe from all the ridiculous ads and AUTO PLAY videos. However good this recipe is, I will be staying away from ditchrhecarbs.com because I can’t guarantee the I’ll actually get to see the recipe. I have substituted the butter for peanut butter. Meridian Palm oil free one. Absolutely lovely, texture is like old school cookies , very pleased with them. Also used coconut sugar so the over all colour is darker but still fab. Made without the choc chips , added 91% dark chocolate on top ……. Flipping gorgeous. My husband and I are Ketoing and these went down well. Like you said, sweetness must be to your own taste, but the recommended amount is just right for us. Thank you. Amazing! These are so tasty and the perfect treat to cure a sweet tooth. Thanks for sharing. I have tried these three times now and they still spread all over the baking sheet! I really don’t know what I’m doing wrong! They come out like flat cake. Can I make them in a small tart tin, so they don’t spread? It sounds like your coconut flour isn’t behaving correctly. Try another brand as the texture should be like play-doh. They don’t spread out at all. Or are you using large eggs so there is too much moisture? Even try to add more coconut flour to make the cookie firmer before buying another brand perhaps? Thank you, I will try that next time, they still taste really nice. Also just soften the butter ‘naturally’. putting them in the microwave make them too liquid. And I read somewhere here I think you can add a tablespoon of coconut flour if it is not forming properly. Hope you found the best way to keep them from spreading too much. I made a batch of these for the first time with my daughter and to be honest I wasn’t expecting much. OMG they were amazing!! so soft and buttery with sweet vanilla flavor absolutely blown away. Thanks very much btw I used xylitol only 3tbsp and drizzled dark chocolate 85% coca over them when they were finished and left them to chill in the fridge. Hi. I live in Australia and I can’t seem to find swerve or the cacao nibs that are pictured here. The nine I buy are almost like a powder and are not chunky bits like the ones in your video. Did you use swerve in this recipe? And do you know if I can buy that and the cacao nibs online?? 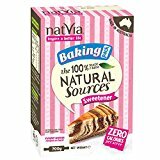 In australia you can buy Natvia which is stevia/erythritol. That is what I commonly buy here in NZ too. The cacao nibs I just buy in my local supermarket, in the healthy baking aisle. Maybe someone here can comment where you can buy them in Aus. Alternatively you may be able to buy some sugar free chocolate chips to use instead. I make these once a month and really enjoy them as a treat! They are even better after a day or two! So easy to make, and I am NOT a baker! That’s awesome! 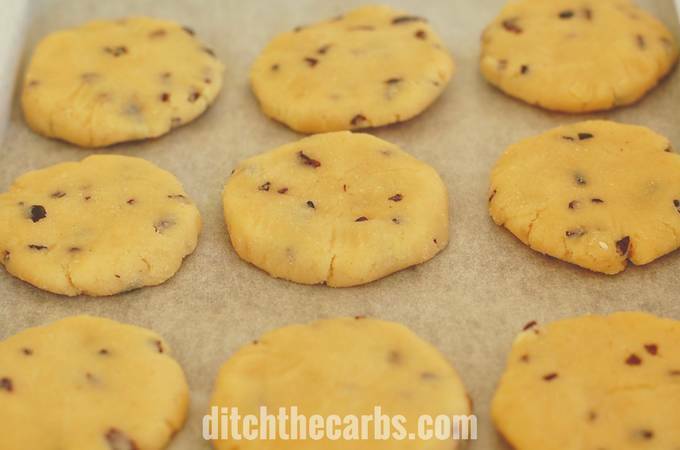 These have quickly become the most popular low-carb cookie on my site. I just made these and the bottoms turned brown after 5 minutes. If I didn’t take them out they would have burnt. The tops are not light golden brown like the recipe said. Where am I going wrong? It sounds like your oven is not evenly cooking these. I cook mine and turn halfway through so they look golden and cooked. If you have fan baking option, perhaps try to use that setting next time. Alternatively, make them thinner so they cook evenly on the bottom and top before burning. Hi Libby. I made these today, mixed them in my new Thermomix 5, which is also new to me. My cookies turned out very dry and crumbly, so not very tasty. I could not make them into balls or any shape at all with my hands due to being dry mixture. Any ideas on where I went wrong? Any suggestions? I make them in my TM5 all the time. Cream butter and xylitol for 6 sec sp4, scrape sides then add other ingredients and mix sp4 for 5 sec. They turn out perfectly. My oven only has too heat and so took 20 mins and I could have baked longer (not all were browning). I added Lily’s sugar free chocolate chips and some Pecan pieces instead of nibs. Next time I may try maple extract instead of vanilla for something different. After cooling 10 minutes these were soft but held their shape perfectly. Good recipe! I tried these today and it was a little different that expected. I didn’t realize the nibs would not melt and the stevia I used ( 4 tbsp. per recipe) did not make them sweet. They were little softer after I let them cool a bit but next time I will tweak the recipe with more sweetener and more flavor. There are nice though for this WOE. Made these last night with just 3 tablespoons of stevia, as I am always trying to get us used to enjoying less sweetness. The texture is different to a crisper biscuit made with sugar and wheat flour, but very excited to be able to make a little treat to have with an evening cup of tea that is only 2 grams of carbohydrate. I used cacao nibs as we regularly buy these now and use them in our berry yoghurt, love the texture they give and the dense cocoa flavour. You do get used to not having the sweetness of chocolate bits, and to enjoy the dense cocoa flavour. Sometimes I even just crunch a few! Me too. I love crunching on cacao nibs and don’t miss that sickly sugar taste any more. I added a bit of lemon zest to these biscuits last night, anomy kids love them. Next time I will add orange zest. Have you tried making “browned butter” and making these cookies? Wondering if it would help to knock it up a notch and give it a brown sugary flavor like my old favorite recipe. I’m considering trying it. Oooh, no, but what a great idea. I did however at the weekend, add some lemon zest with the cacao nibs. My kids tell me they were yummy. I am conducting an experiment: I’ve frozen some of the dough (3 cookie balls) to see how they go after defrosting and baking. If these cookies pass the freezer test, this recipe will be a constant in my kitchen. Been low carb for 2 weeks now – easiest ‘diet’ I’ve ever done. A big thank you for this website, it has made my transition very easy. I’ve printed about 50 recipes today!! Brilliant!! Please come back and let me know the results of your ‘experiment’. I’m guessing you could also roll the cookie dough into a log then slice off one cookie at a time to cook. P.S. Don’t let on how easy this ‘diet’ is, everyone thinks we are deprived and lack any sense of fun by giving up sugar and junk food 😉 If only they knew (insert snorting laughing here). You don’t happen to have the measurements in teaspoons / cups? Yes, all my recipes now have a big red box beneath them so you can easily switch between grams and US measurements. You can even change the number of servings and the quantities will recalculate themselves as if by magic. Yay. I love that you do that. I prefer to weigh dry ingredients. Too easy to get too much of flours. To make these savory do u only omit the sweetener and add herbs? I’ve never made the savoury, but yes, I think your swaps would work. Did you try this and did they work? Amazing recipe, perfect with the Bullet proof coffee in the morning, definitely gana be a weekly staple in my pantry. Omg… so so so awesome!!! Love how moist and soft these cookies are! Amazing and thx for sharing! Btw- how’s long does it keep out of the refrigerator? I keep them in an airtight container in my cool pantry for 3 days (but they generally are eaten within 2 😉 ). Not in this recipe I’m afraid. I am trying to develop an almond flour recipe, so stay tined, it will be here soon. Unfortunately coconut and almond flours are not interchangeable. Read this article why. Going to try these cookies. Will be great to have an alternative to the pizza and cookie lunch fundraisers that the school has three times a term. These look soooo delicious but I cant have eggs (or dairy)… is there something I could substitute the eggs for? Sorry but not really in this recipe. The egg helps bind the cookies together. Try aquafaba and ground flax. It call superegg. Lily’s uses stevia and erythritol. I love youre recipes, trying a lot of them. So glad i found them. Even my kids love some of it, there not low carb and are very suspicious of my baking results. I love it that you use grams/ metrics most foreign recipes i know are using cups, this makes it far easier for my. Being Dutch. It’s pouring rain here, i think i am making this a baking day. So excited to try these!!!!!! I bake for my grandsons and adapt most of your recipes to use light olive oil or coconut oil in place of butter as I need to make them both gluten and dairy free. Hopefully this will work for this recipe. Fantastic!! Aren’t you the best grandma ever?! Hi Lynda, did you tried with coconut oil?! How much did u used?! I want to make them diary free as well!! Thanks!!! I used coconut oil. About the same amount as a stick of butter but just did that by eye not measurement. It worked out great! Love these cookies. They will help keep me on track with low carb eating as I get my sweet cookie type fix and the fibre keeps me regular too. That can be a problem when I omit whole grains.